I am planning on homeschooling my daughter in the fall. She will be in 7th grade. I am intimidated by the whole idea. I'm afraid I don't know enough. I'm afraid I won't pick the right curriculum. I'm afraid I won't be able to give her what she needs and keep up with everything else I have to do. 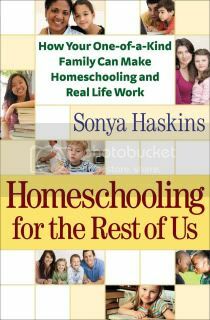 That is why I snatched up the chance to read and review Homeschooling for the Rest of Us by Sonya Haskins. I feel like I need all the help I can get. It was a reassuring book. Overall, I walked away with a good impression. I feel like it helped me to be more confident in my decision. It has practical advice on socialization, coops, attitudes and relationships. Even if you are not a homeschooler, there is useful information in this book! Tips on dealing with relatives and their opinions on your decisions, tips on chores for children, streamlining your household, tips on on trimming and staying on budget, tips on nurturing your child's heart, take your pick! All are useful for any parent, even if you are not homeschooling. While the book was good, I did have a hard time getting through the first couple of chapters, so if you do read it, stick with it. Sonya Haskins and her family see each day as an adventure in learning. A homeschooling consultant and mom of five children, ages six to thirteen, she is also the author of The Homeschooler's Book of Lists and six regional history books. Sonya and her husband and children live in Jonesborough, Tennessee.